True, but not buying products from a company doesn't mean you voted for them in that poll. I don't buy Chick-Fil-A because I don't support them, but I'm not about to go and report them to the BBB as an affront to business. I'm not even referring to their business practices-- someone could really just take issue with their games and how they make them now. I could see that being a totally viable reason. I'm just not buying anything with Origins. I thought it was a pretty interesting talk. It's all about the history of Playstation, the difficulties in software development as hardware advances, and the design philosophy behind PS4. But be warned that it's quite long. 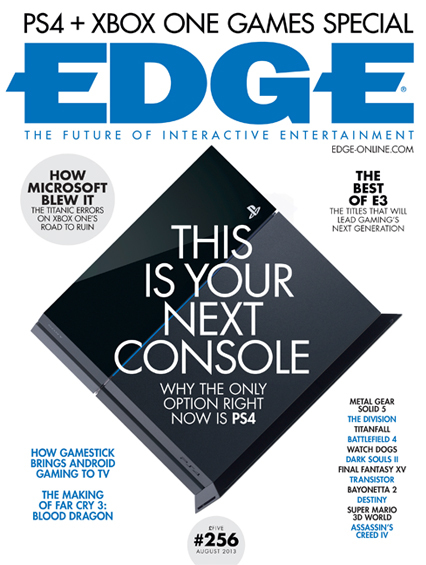 The best part though is the PS4 + Xbone games special, followed immediately by the rest of the cover basically telling you to disregard the Xbone. "Sony's PS4 dev kit passed by the FCC roughly a week ago, and now its consumer-oriented counterpart has passed through Uncle Sam's offices." Well... yeah? Any internet enabled device with a high speed connection can. Exactly. Which is why the whole 'cloud' thing is nothing but meaningless marketing wharrgarbl in the first place. This has probably be linked somewhere around here already, but I'll just reiterate it: Digital Foundry on the Xbox One's cloud. "For one week in August 2013, the Koelnmesse in Cologne, Germany becomes the centre of the gaming universe as the world's biggest publishers and developers invite you to check out the games that will light up the rest of the year and beyond. We'll kick off the show at 18:00 BST on 20 August 2013 with a briefing to media on our release plans for PlayStation 4, as well as updates on PlayStation 3 and PlayStation Vita."